Need some family time at some place far and nice? El House at Lonavala with its pretty interiors and green exteriors, is a wonderful staycation to spend a long weekend with the loved ones. 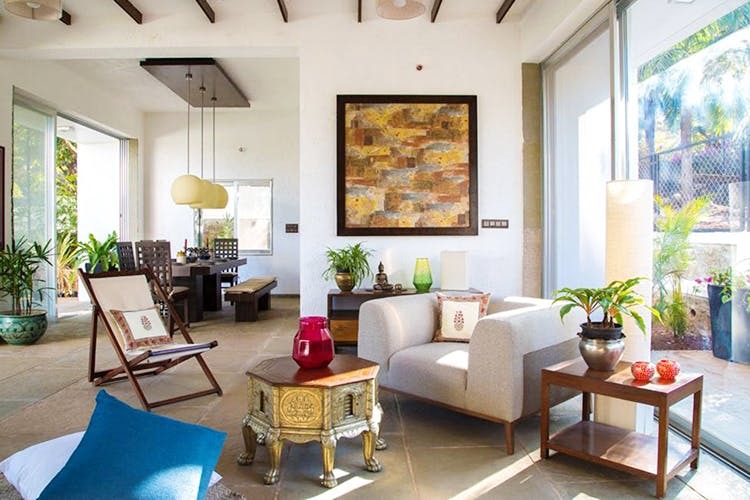 Located at Kunegaon, El House is a gorgeous property amidst tall trees and manicured lawns. It's serene, pleasant and has an instant positive vibe. The villa has full-length glass panes throughout that let in lots of natural light. The decor is quite tasteful too - abstract art on walls, vintage furniture, potted indoor plants, colour-coordinated rooms and more. Additionally, there is an outdoor pool, a well-kept kitchenette and a huge terrace with great views. El House has four spacious bedrooms that can hold about 10-12 persons at a time, which makes it ideal for those big, family vacations or get-together. The prices for a night start at INR 22,200 and can go up to INR 30,000 (for the entire villa) depending on the season, availability and number of guests. We wish there were some arrangements for barbecue too. Book your stay at least 7-10 days prior your visit.